"All authentic art is conceived at a sacred moment and nourished in a blessed hour; an inner impulse creates it, often without the artist being aware of it." Seeking to capture an experience of the infinite, Caspar David Friedrich composed works that directly confronted the viewer with the awesome. Friedrich took the genre of landscape painting, traditionally considered unimportant, and infused it with deep religious and spiritual significance. Believing that the majesty of the natural world could only reflect the magnificence of God, he featured sunlight vistas and foggy expanses to convey the beautiful power of the divine. Friedrich's moody landscapes, which often thrust the viewer into the wilds of nature, created an emotional connection with the viewer rather than a more literal interaction with the scene. This integration of spiritual significance with landscape painting made him a popular success. While conservative contemporaries challenged Friedrich's allegorical and religious landscapes, the artist maintained that his work never simply replicated a view, but rather provided opportunity to contemplate God's presence in the world. Using dramatic perspectives and misty, untamed expanses that dwarfed any figures, Friedrich encouraged the viewer to accept the awesome power of nature as evidence of a divine spirit. Dismissing the picturesque traditions of landscape painting, Friedrich embraced the Romantic notion of the sublime. Through his sensitive depictions of mist, fog, darkness, and light, the artist conveyed the infinite power and timelessness of the natural realm; the viewer is physically reminded of his frailty and insignificance. Friedrich's subtle color palette and emphasis on light often created an overwhelming sense of emptiness that would influence Modern Art. The visual minimalism of his paintings was so unusual that his audiences were often confused; reportedly, one group of art enthusiasts who visited his studio viewed a work upside down on the easel, believing the clouds were waves and the water was the sky. Modernists would learn from his use of subdued color and the simplicity of his compositions that still conveyed profound ideas. 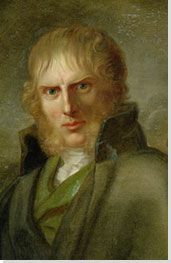 The sixth of ten children, Caspar David Friedrich was born into a strict Lutheran family. He became familiar with tragedy at an early age, losing his mother when he was seven, and two sisters to childhood illnesses. Perhaps the most impactful loss was the death of his brother, Johann, who drowned while trying to rescue the then thirteen-year-old artist when he fell through the ice. Commonly referred to as The Tetschen Altar, Friedrich's The Cross in the Mountains features a pine-covered mountaintop upon which stands a large crucifix. The cloud-filled sky is rendered in shades of red, pink, and violet which fade from dark to light from the top to the bottom of the canvas. Five beams of light emanate from a distant, unseen horizon. This simple painting of a mountain peak awash in a white mist of early dawn fog, surrounded by barely discernable pine trees and rocky outcroppings manifests Friedrich's ideals of the Romantic landscape. This majestic, remote view of monumental nature implied a connection to a higher power, particularly in its scale and use of light. Here, a break in the clouds allows light to shine through, as if illuminating the mountain peak with a divine light. 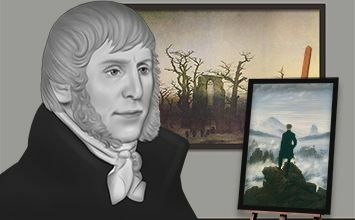 Arguably one of Friedrich's most important and well-known works in his oeuvre, this painting launched the artist to international fame when it was exhibited with The Abbey in the Oak Woods (1808-10) at an 1810 art exhibition in Berlin. A vast, empty landscape is dominated by the top three quarters of the canvas, which depicts a blue-gray sky and green sea. The foreground is an uneven swath of beige land where, just left of center, stands a man. Although his back is to the viewer, he is identifiable by the long, dark robe of a monk. The canvas is filled with large expanses of color, punctuated by small brushstrokes of white to denote a few crests of waves and birds in the sky. It is a masterpiece of minimalism and pictorial restraint, while still conjuring a felt sensation of awe, wonder, and humility. A study in subtle colors, rendered in soft shades of browns, yellows, and white, this painting depicts the crumbling remains of a Gothic abbey set amongst a field of barren leafless trees. The outlines of cross markers and tombstones are scattered around the remaining wall of the abbey entrance with its tall thin window. The bare outline of a few monks can be seen about to pass through what remains of the church's entrance, perhaps making a pilgrimage to mourn the dead. Wanderer above a Sea of Fog (sometimes also referred to as "Sea of Mist") depicts a lone man, formally dressed and holding a walking cane, standing on an outcropping of rocks looking out at an inhospitable expanse. He stands perfectly still, only his hair ruffled by an unseen wind, against a tumultuous field that churns at his feet. In the background is a sky filled with white puffy clouds and the outline of mountaintops barely visible through the mist. As the man contemplates the vastness before him, the sublimity of nature is demonstrated not in a calm, serene view, but in the sheer power of what natural forces can accomplish. Caspar David Friedrich's On the Sailing Boat features the bow of a ship heading towards the horizon. Two figures, a man in a blue suit and hat and a woman in a pink dress with white lace collar, hold hands while looking at what lays ahead. The right side of the canvas is consumed by a closely focused depiction of the sail and the boat's mast. In the distance, the viewer can discern the faint outline of buildings, silhouetted in mist. The largest expanse of the canvas is occupied by a glowing yellow sky. A small work measuring only 8 ? x 12 inches, Morning was intended to be part of a cycle of the times of day. It is a scene of quiet stillness that evokes the early morning. The mist lies low, wrapping around the pine trees in the midground, but beyond the sun rises above the distant mountains. In the foreground, a lone figure rows a boat, perhaps setting out from the small house whose roof is just visible about the fog. The sky is awash in the colors cast by the rising sun: yellow, orange, violet, and soft pinks. Set against a vivid blue sky, the focal point of the painting is the wreckage of a ship that has crashed into the ice and the rocks of the shore. On the right of the canvas, a small portion of a ship's hull is visible rising out from broken chunks of ice. In The Stages of Life, five ships are at sea, moving toward a distant horizon. They are mirrored by five figures depicted on the grassy shore in the foreground: two small children, a boy and a girl, are watched by a young woman while a middle-aged man turns back from the water to address an elderly man in a long formal coat, hat, and cane. Dating from the later years of Friedrich's life, when the artist had withdrawn into near solitude, scholars have argued that the elderly man is a self-portrait and the others represent Friedrich's nephew and his three children.